The McCord Brothers are the most eligible bachelors in Spring Hill, Texas. But these cowboys are about to get wrangled by the love of some very special women—the kind who can melt hearts and lay it all on the line. Air force Captain Riley McCord has come home on medical leave to find one heck of a welcome reception. Every unattached woman in Spring Hill, Texas, wants to nurse him back to health. That includes his childhood friend Claire Davidson—the only person who understands how damaged he really feels. In high school, she chose his best friend over him. According to Riley’s rules, that should make her off-limits forever. But when Claire suggests a no-strings fling, he can’t refuse. Claire always wanted Riley—but she also craved the safety and stability he couldn’t offer. So she chose another path, only to end up crazier about him than ever. She’s even convinced herself that this time she won’t be devastated when he leaves. Yet once Riley realizes the depth of Claire’s feelings—and his own—he’ll have to make the ultimate choice: return to the job he loves or stay home for the woman who’s always lived in his heart. Captain Riley McCord is hoping for some peaceful downtime as he returns home to recover from his injuries but unfortunately for him, that’s not the case. News of his homecoming has made the rounds and he has a robust welcoming committee in the form of all the town’s unattached women tripping over themselves to provide him with some TLC. Except the one person he would totally welcome some TLC from – his childhood friend Claire Davidson. Claire who chose his best friend over him and is now firmly off-limits to him. But even his rules can’t keep him away from Claire this time, especially as she’s just as willing as he is to give in to the attraction between them. The only question is: what will happen when he has to return to work? Riley has always had Claire’s heart but his choice of career meant he could not offer her the stability she hungered for, so she made a safer choice. Now that Riley is back, Claire is willing to take a chance on him even though she knows that he won’t stay and he’ll definitely be leaving with a piece of her heart. This story is sweet and entertaining, with very realistic characters facing difficult choices. Riley has always measured his worth by his extraordinary accomplishments and isn’t willing to entertain the thought that his injuries (both physical and mental) could mean the end of his career and a return to an ordinary life, never mind that that life could have Claire and her adorable son in it. Claire’s abandonment by her parents left an open wound that has never healed and the death of her grandmother only makes the hurt worse. Obviously, these two are not in the best shape to make any major choices regarding their futures and between Riley’s indecision and Claire’s passive-aggressive way of dealing with issues, as well as the other love interests, there was a lot going on, some of it irritating and some of it funny but all very interesting. Honestly my favorite character is Livvy and my favorite phrase? Now, you just have to read the book to find out why! TEXAS ON MY MIND illustrates the best and worst of small towns especially the lack of privacy, and the writing was very good. Ms. Fossen did a great job capturing the emotions and choices Claire and Riley struggled with. Overall, the story was enjoyable even though the ending was too easy for me, but I’m intrigued by the glimpses of the McCord siblings and the overall direction of the series, so I will be keeping up with the rest of the books. When Delores Fossen was a child, she used to sneak around and collect fingerprints, hair strands and fibers left by family members and guests. At age eight, she solved a crime. Well, sort of. When someone nibbled off the ear of her chocolate Easter bunny , she searched for clues and soon discovered that her sister had chocolate bunny breath. 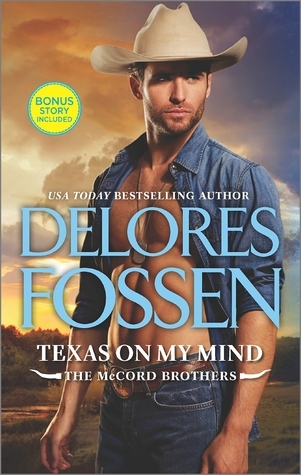 With that "case closed," Delores believed she’d discovered her calling--she wanted to be a Texas Ranger or FBI agent. But after realizing that she just wouldn't be very good at chasing down bad guys, she opted for a slightly different career path--she creates fictional cowboy cops and other law enforcement officers. Writing romantic suspense is something she enjoys immensely, and it has earned her the Romantic Times Reviewers Choice and Booksellers Best Awards, and she was a finalist for the prestigious Rita. Aah, small towns … such drama to be had there!